Gwyn Morgan rose from his modest roots on an Alberta farm to become one of Canada’s foremost business leaders and ardent champion of the importance of Canadian-headquartered international enterprises. Gwyn has served on the board of directors of five global corporations. 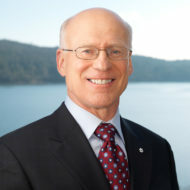 He serves as a trustee of the Fraser Institute, and the Manning Centre for Building Democracy. He devoted three decades to building EnCana Corp. into Canada’s largest energy company. When he stepped down as founding CEO at the end of 2005, EnCana was Canada’s most valuable company with a stock market value of approximately $60-billion. Gwyn has been recognized as Canada’s Outstanding CEO of the Year and also as Canada’s Most Respected CEO. He has been inducted as a Member of The Order of Canada.